My latest contribution to the PMI Voices on project management blog has just been published: The Power of Happiness – I’m not sure how my attempt to educate PMI on the joys of cricket will go but the underlying message on the link between happiness and team performance is universal. The generally accepted definition of Free Float is found in the PMBOK® Guide the glossary definition is: Free Float The amount of time that a schedule activity can be delayed, without delaying the early start date of any successor or violating a schedule constraint. This post asks is this true or do we need a more precise definition? The simple network above demonstrates the problem. Tasks A, B and C are connected Finish-to-Finish 0; C to E is Finish-to-Start 0. The Network is drawn to a time scale. The traditional definition for Free Float works for Task C through the Finish-to-Start link. 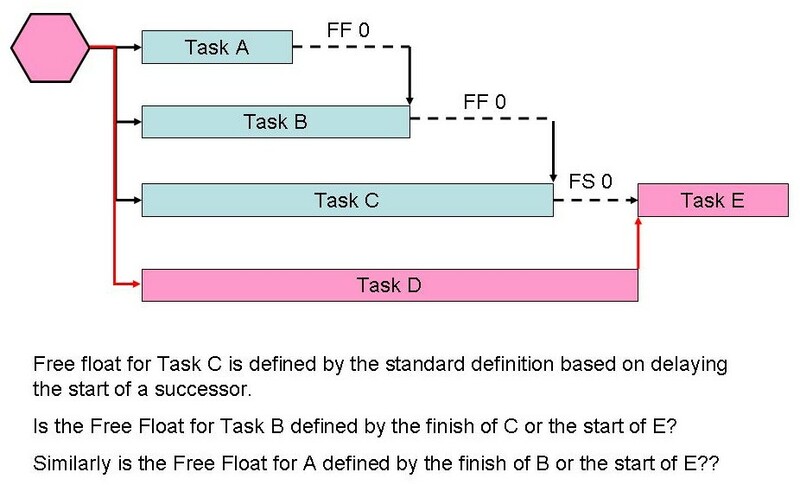 The traditional definition for Free Float also works for Tasks A and B provided Tasks B and C respectively are defined as contiguous tasks, as soon as the completion of B or C is impacted, the start of the task is also impacted because the duration is fixed and there is no more Free Float. However, if the tasks are non-contiguous, meaning the elapsed period between the start and the finish can be greater than the duration (stretchable is another term) we have a problem. The finish can be moved back without delaying the start. In this situation is the Free Float defined by delaying the Early Finish of the immediate successor, or does it cascade through to the start of Task E? A similar problem occurs if there are actual start dates for any of the activities, once there is an actual start date it does not change regardless of what happens to the finish date. Is a better definition for Free Float: The amount of time a schedule activity can be delayed without delaying the early start or finish date of any successor or violating a schedule constraint. This definition would limit the free float on task A by the Early Finish date of Task B regardless of the task type and/or progress information. But this is not the current definition. What I will be very interested in hearing is the scheduling communities views on this topic – what is the correct definition and does it really matter?? Emails can be communication, spam or worse, a completely pointless waste of time! Every communication you send should be for a specific purpose and optimised to achieve the desired affect. This includes emails and particularly anyone you ‘cc’. Even spammers have clear objectives and measure the results of their obnoxious, but profitable, trade. Before sending you next email read through this infographic from Visually – it’s amusing but carries a valuable message. Then decide if your next email is a useful communication. 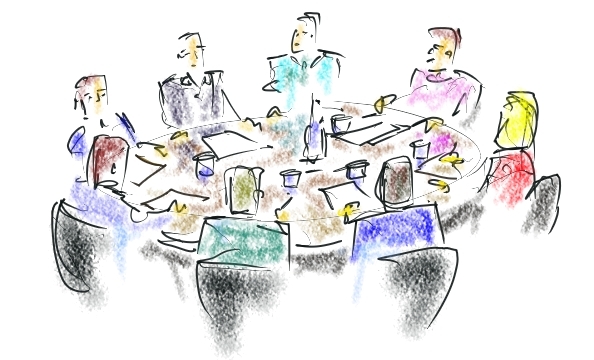 One of our more downloaded White Papers is WP1075 Managing Meetings. If your job involves arranging meetings then you need to get both your strategy and your tactics right to create a short, effective, useful and enjoyable experience for everyone! To get the most out of your meetings, you need to plan them wisely. Prior to each meeting, write down the specific objectives that you want from the meeting. Then work out how you’re going to achieve them! People remember the opening and the closure the most. So open and close your meetings carefully. When you open the meeting, tell them what the purpose of the meeting is, what you want to get out of it and why it’s important. This gets their attention and sets the scene. When you close the meeting, tell them what has been agreed / achieved in the meeting and the next steps going forward. Start by standing or sitting in a prominent place in the room. Raise your voice a little to add presence. Jump in frequently when people talk too long. Be polite but strong. Control the meeting as a coach would control a football team – by constantly watching, listening and directing the team. If possible, ask someone else to record the minutes. This gives you the time needed to control the meeting so that the agenda and your goals are met. Issues and disputes can consume the majority of the meeting time. Provided the issue is not related to your specific meeting goals, then tell the team to ‘park it and move on’. Record the issue on a whiteboard or paper and address it with the relevant team members separately after the meeting. This keeps your meetings short and focused. Make sure that where possible, every discussion results in an action to be completed and the ‘action item’ should be assigned to a responsible owner for completing. Send out a meeting agenda in advance with any anticipated items that you may need specific attendees to address highlighted to that person. This way people can come prepared to provide meaningful contributions. Start and finish the meeting on time. Your attendance and participation level will be better if people know you have a reputation for getting right to business on time and that your meetings don’t run on forever. Start it on time, be productive and then end it. Don’t repeat everything for late-comers. If you have to update someone on a key point that has already been discussed in their absence, do so quickly. And if they missed their time to discuss their specific tasks, move them to the end of the line–get back to them after you’ve gone through the rest of the team. If you have a reputation for being on time with your meetings you won’t have too many problems with people arriving or calling in late. Release everyone as soon as business has been conducted. When the meeting is over, close it out with a brief verbal summary of action items and let everyone know the action list will be circulated within a few minutes. And then end the meeting. Cancel a meeting if you believe there’s nothing new to discuss. If you’ve set up a meeting but there’s nothing new to discuss or key contributors cannot attend, then cancel it or re-schedule it. On the flip side, be careful not to do this too often. Otherwise people will come to expect your scheduled meetings to not happen and they will either come unprepared or not come at all. Focus the meeting on the agenda. Try to recognise when the side discussions start to get out of hand and ask those individuals to call a separate meeting to discuss or ‘park it’. Publish action items within minutes. Action items are delegated to specific people, but he list is sent to everyone (see more on delegation). Follow up with the minutes containing a status summary of what was discussed, decisions that were made, action items that were assigned, when things are due and when the next meeting will be held within a day. Send it out via e-mail and ask attendees to respond if they see anything incorrect or feel that anything should be added. That way you’ve essential documented that everyone is on the same page. For more detailed advice on managing your meetings download the White Paper WP1075 Managing Meetings. Applied effectively these ideas can free up a massive amount of time! Project Governance and Controls Symposium to Host Book Debut! This year the PMGlobal Foundation are pleased to announce the Project Governance and Controls Symposium will host the Australian debut of Mark Phillips’s book entitled, ‘Reinventing Communication: How to Design, Lead and Manage High Performing Projects’. The launch will be a noteworthy event for delegates, set against the backdrop of The Australian Defence Force Academy (ADFA), venue for the 2014 Symposium. Mr. Mark Phillips is the President of Standpipe Manager, Inc. a private, U.S. based consultancy delivering innovative program management services to industry and government. He is passionate about finding new ways to solve problems and inspire others. His ideas are in use in the U.S. Department of Defense which has said “Mark Phillips’ method…has the potential of being a game changer for successful program management teams.” His works has appeared in C|Net, eWeek and the Small Wars Journal. His book “Reinventing Communication: How to Design, Lead and Manage High Performing Projects” is forthcoming April 2014 from Gower Press. His sessions are highly interactive, focused specifically on addressing participants’ challenges. Mark is a board member of the College of Performance Management. Find out more about the Symposium Program. Be Part of the Symposium Program! The Committee are still welcoming submissions for the 2014 Symposium. To secure your spot in the Industry Presentation stream in the program please refer to the submission guidelines or email me (Industry Presentation Stream Organiser) at patw@mosaicprojects.com.au for more information. For those who wish to submit an Academic Paper and advance the knowledge associated with Project, Program and Portfolio (PPP) governance and control, refer to the Academic Paper Stream collection process. There are commercially exciting opportunities for your business to reach a targeted Project Controls and Governance market in an environment dedicated to the Controls and Governance space. If your business objective in 2014 is to increase your profile and market share in the Project Controls and Governance market places, we invite you to find out how you can maximise your impact on your target market through sponsorship of the PMGlobal Project Governance and Controls Symposium by clicking here. PMP, CAPM and PMI-SP scores are all based on how well you answer multi-choice questions in your exam. Unfortunately, the information provided to candidates at the end of their PMI exam is limited. You are told if you have passed or failed based on the number of questions correctly answered (but the passing score is a secret) and you are told how well you have performed in a general sense but little in the way of specific data, even with the vastly improved feedback rolled out in 2017. In reality, the only option is to be happy if you are in the 70% to 80% who pass and talk to your training provider if you have failed. You cannot get anything additional out of PMI. However, what many people don’t fully appreciate is the effect of the four options in the PMI multi-choice format and why a score of 55% is definitely in the ‘fail’ category! The cause is the fact that one of the options will always be correct, therefore a set of random guesses will score 25% on average, and the more questions you answer the more the 25% will come into play. The challenge is working out what proportion of the 55% can be attributed to ‘knowing the right answer’ and what proportion is likely to be consequence of the ‘lucky 25%’. This chart is one way of assessing what you really know from any score achieved in a 4-option multi-choice question exam. If you don’t know the answer to any question and guess the lot, should still score around 25%. Conversely if you know the correct answer to every question, there are none left to be affected by the ‘25% luck’ factor. Between these two lines, there are a steadily decreasing number of questions that you did not know the right answer to but got a correct answer to based on the ‘25% luck’ factor. This 25% factor is represented by the Green Line. See what your score is and convert it to a percentage. This is your ‘Total Score’ on the vertical axis, and is represented by the Light Blue line. 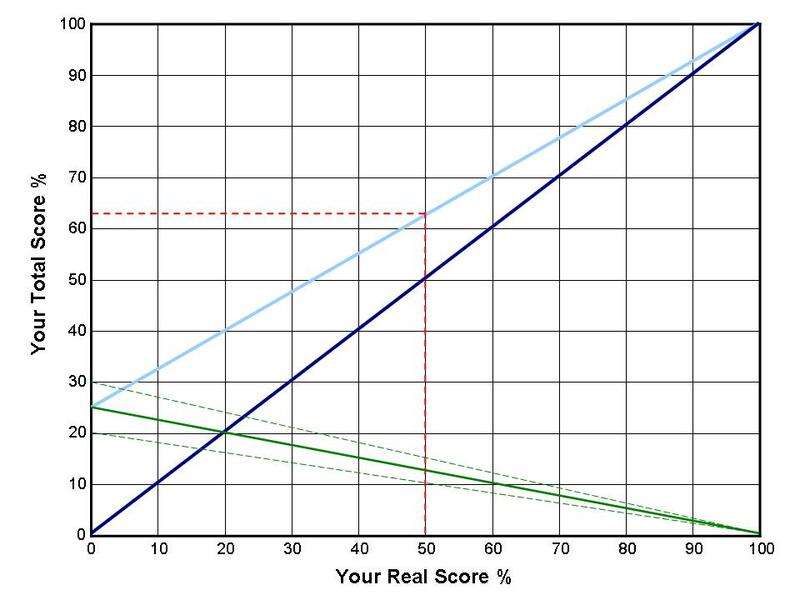 Look down the chart to see your real score on the horizontal axis, and the Dark Blue and Green lines will give you an approximate split. For example, if you scored 62.5% in total, you probably know the answer to around 50% of the questions and the random factor added another 12.5%. Taking into account the possible distribution of results, the ‘luck factor’ is probably somewhere between 10% and 15% (at ± 1SD) meaning there is a 65% probability you actually scored somewhere between 47.5% and 52.5% (but the effect in any specific test may be greater). This chart explains why PMI has set a passing score above 60% in the past (when we knew this information) and seem to have maintained this policy into the present time. A score of around 65% would assure PMI the candidate probably achieved a score of 50% or better from knowledge. But there are a number of issues with the chart. The first major problem is that on average there will be a ‘25% luck’ factor affecting the questions you don’t know the right answer to, but some people will be luckier than others. Based on a series of Monte Carlo analyses by Jesus Carrillo we can assume 1 Standard Deviation is a bit less than 5 (at the starting point), therefore the ‘luck factor’ in around 65% of all tests will fall somewhere within the two dotted green lines (see comments below). The number of questions subject to the 25% luck factor decreases as the number of questions you answer correctly increases and because we are dealing with whole numbers this introduced some distortions (skew) into the assessment, as does the 3:1 ratio between wrong and right answers. The chart is a simplification of quite complex data which hopefully does not limit its usefulness. The next major problem is very few questions will be answered randomly. Most trainers tell there candidates to make sure you answer every question, but the majority of questions will have a considered answer, some considered correctly and other considered incorrectly. This factor is impossible to graph. There is no way of knowing which specific questions were answered correctly for the ‘right reason’ and which were in the lucky 25%. You need to check the answers from you training organisation to see if you were ‘right for the right reason’. Next time you test you take a practice test use this chart to asses your real level of knowledge but make sure you check all of the answers you got right so you can identify the questions you got right for the wrong reason, the ‘25% luck’ factor. One of the reasons we set our trainees a benchmark score of 75% in our coursework is to help overcome the factors discussed in this post. By the time you are scoring around 75% the effect of the 25% random variability has reduced well below 10% and we know you know enough to score around 65% in the exam without the luck factor. This means most people will pass most of the time; score below 75% and you are starting to rely on the 25% luck factor and there is always a chance you may not have an average amount of luck on exam day.